Notion 4 has features for composing and playback. 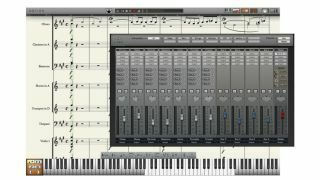 Notion Music's Notion has always been billed as not just a score writing package but a composing one as well, and the update to version 4 brings what appear to be some significant enhancements. To begin with, there's now native 64-bit support for OS X and Windows, plus new and interactive note entry tools (Keyboard, Fretboard, Drum Pad, Chord Library). 64-bit ReWire support is in place too, as is MIDI recording and overdubbing. It's also possible to view notation and MIDI data on the same staff. Notion Music is keen to point out that two-way transfer of files between its desktop and iPad apps is entirely possible. More details below. Notion 4 is available now for the introductory price of £83/$99 (download). Notion gives you the best playback of any notation product. Orchestral samples recorded by the London Symphony Orchestra at Abbey Road Studios. Guitar samples by Neil Zaza, bass samples by Victor Wooten and drum samples by Roy "Futureman" Wooten. Notion's SequencerStaff feature is loved by many. Now, there is Sequencer Overlay. This is a feature that allows you to see both notation and its MIDI performance on the same staff. You can edit each individual note's velocity, duration, start-point and end point by simple click and drag functions. For precise values, you can double click each note and enter in the numeric values as well. With this feature, Notion combines the power of the MIDI sequencer with the clarity of standard notation in a unique and powerful way.